The components of swallowable self-righting device which can inject drugs from inside the stomach. The new invention, reported Feb. 7, 2019, by an MIT-led research team, has been tested only in animals so far. But if it pans out, it might offer a work-around to make not just insulin but a variety of usually injected medicines a little easier to take. 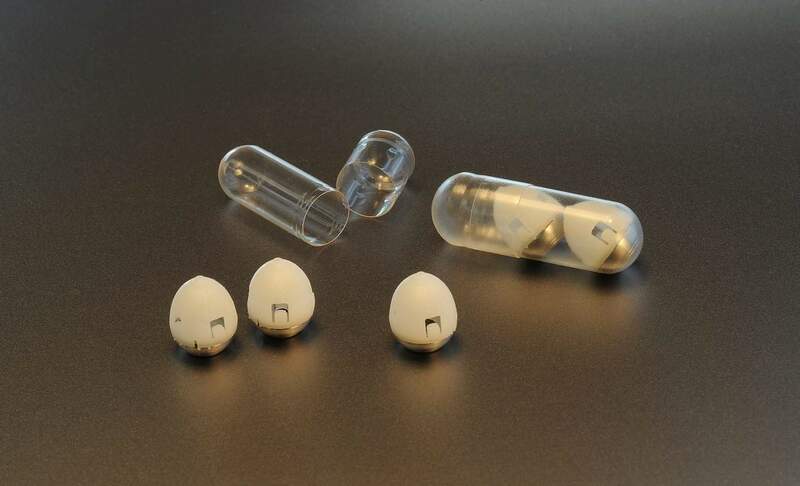 WASHINGTON – Scientists figured out how to hide a shot inside a pea-sized pill – creating a swallowable gadget, inspired by a tortoise shell, that can inject medicines like insulin from inside the stomach. Patients usually prefer oral treatment, and comply with it better, but many compounds, including insulin for diabetes, can’t survive the harsh trip through the digestive system. The new invention, reported Thursday by a Massachusetts Institute of Technology-led research team, has been tested only in animals so far. But if it pans out, it might offer a work-around to make not just insulin but a variety of usually injected medicines a little easier to take. “It’s like a miniaturized rocket launcher” for insulin, said Willem Mulder of Mount Sinai’s Translational and Molecular Imaging Institute, who wasn’t involved in the new research. An ingestible injection could bypass the hazards of that journey – letting insulin absorb through the wall of the stomach, said Dr. Giovanni Traverso, a gastroenterologist at Boston’s Brigham & Women’s Hospital and a senior author of the study. “The way this works is it travels down the esophagus in seconds, it’s in the stomach within a few minutes, and then you get the drug,” said Traverso, who worked with a team from the lab of MIT inventor Robert Langer and insulin maker Novo Nordisk. The first challenge: How to make sure the device lands where it can poke into the right spot, even if someone’s moving around. Researchers looked to nature for ideas. In pigs, the ingestible injection lowered blood sugar to levels comparable to standard shots, according to the study published Thursday in the journal Science.